I had an amazing sail on Sunday. It was blowing around 15 knots steady and the waves were pretty high, but they were not bad once out of the channel's confused waters. Knowing that I didn't want to wrestle with bringing down the main sail in these waves, I decided to let the jib out and just coast a bit, not really thinking that it work too well. I anticipated weather helm from the unbalanced sail plan. I anticipated slow speeds. I got neither. 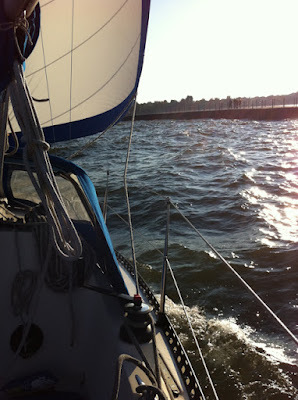 The boat really handled beautifully, and we were doing a steady 4 knots which was fine with me. After a few hours of enjoying the weather we headed back towards port, but this time I had a mission. I chose my course so that I could sail into the channel. I haven't had the confidence to do this before, and certainly wouldn't try it with the mainsail until I had auto-pilot working. However, the jib is on a furler, and I could douse it any time. It took a lot of concentration to keep on course and not lose the sail's nice trim given how the waves were throwing me around, but I did it. It's incredibly cool to silently ghost along the two piers. It's incredibly cool to be learning so much about sailing rather than continuing to hone my epoxy and fiberglass skills. It has been like a gift for me to be able to enjoy the boat after all this hard work, and I appreciate every second of it.